The 3M Scott Safety ProPak-FX-EZ-FLO is a Type 2 open circuit, self-contained, compressed air breathing apparatus. The 3M Scott Safety ProPak-FX-EZ-FLO is a Type 2 open circuit, self-contained, compressed air breathing apparatus. It consists of a back plate, padded carrying harness and pneumatic system, containing a cylinder connector, reducer, pressure gauge, whistle and demand valve. The ProPak-FX-EZ-FLO can be configured in a number of different ways with various size single cylinders. There are also a range of variants available including Airline (AC), Split Demand Valve Coupling (SDC or Y2C), Quick Connect Option or Duo variants. The ProPak-FX-EZ-FLO is used in conjunction with AV3000HT facemask and a choice of composite or steel cylinders. The ProPak-FX-EZ-FLO is specifically designed as a professional fire fighting SCBA, but is also suitable for providing respiratory protection in any IDLH environment. 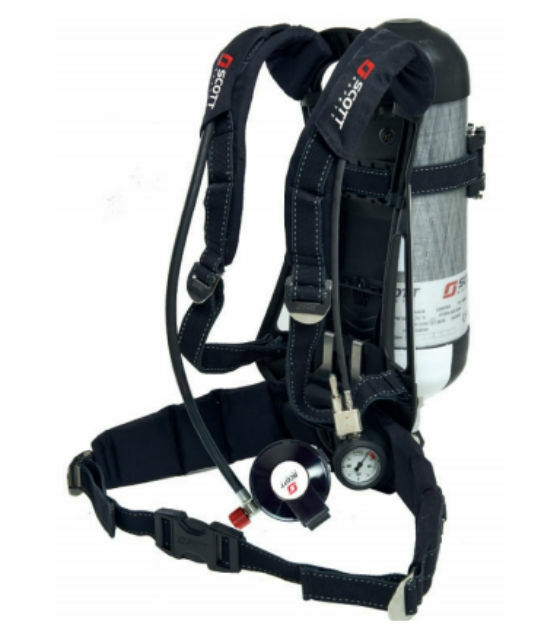 2031988 PROPAK-fx-EZ-Flo (V2) Self contained breathing apparatus for single cylinder use, comprising lightweight rigid backplate with Kevlar and Pyrogard blend cylinder band and fully adjustable padded body harness with swivel movement waistbelt. Fully adjustable backplate can be simply moved to cater for different sized users. Two stage pneumatic system comprising EZ-Flo positive pressure demand valve with bypass: shoulder mounted pressure indicator and 55 bar warning whistle: first stage pressure reducer with single high pressure 200/300 bar cylinder connector. Apparatus is CE Marked to EN137:2006 Type 2 Apparatus supplied less facemask, please order AV3000HT facemask seperately. 2031997 PROPAK-fx-EZ-Flo- CBRN (V2) Self contained breathing apparatus for single cylinder use, comprising lightweight rigid backplate with Kevlar and Pyrogard blend cylinder band and fully adjustable padded body harness with swivel movement waistbelt. Fully adjustable backplate can be simply moved to cater for different sized users. Two stage pneumatic system comprising EZ-Flo positive pressure demand valve with bypass: shoulder mounted pressure indicator and 55 bar warning whistle: first stage pressure reducer with single high pressure 200/300 bar cylinder connector. Apparatus is CE Marked to EN137:2006 Type 2 and BS8468-1 Apparatus supplied less facemask, please order AV3000HT facemask seperately.